To combat white-collar crime is the crying need of the hour. The menace of white-collar crime is alarming day by day. As far as the digital era is concerned, prevention of white-collar crime has become a matter of great concern today. It is a global phenomenon. 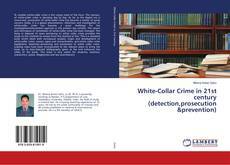 Detection and investigation of white-collar crime has become a great challenge for the investigative/enforcement agencies in the present day context. The means and techniques of commission of white-collar crime has been changed. The delay in disposal of cases pertaining to white collar crime provides the scope to the criminals to escape from the clutches of law. This is a standard book which deals with conceptual analysis, origin and development of white-collar crime, causes, types and characteristics, anti-white collar crime legislations, detection,sentencing and prevention of white collar crime. Leading cases have been incorporated at the relevant place to bring the book up to date.Selected bibliography given at the end enhances the utility of the book. This book is very useful for students, teachers, researchers, police, Magistrates and law practitioners.